Their hearts’ desires could kill them—if the demon doesn’t get them first. In Osiris, true names contain true power. Held in the grip of a demon princess’s curse, without their true names, the citizens of what was once Cairo are doomed to live in constant want, repelled by whatever they need most, trapped in a hellish purgatory . But in this post-apocalyptic city, an unlikely alliance forms to oppose the demon princess Sekhmet. Nate, a fallen angel who can’t participate in deception, bands together with Fan, a witchy thief who’s repelled by water, and her partner Khadaeni, a shapeshifting desert fox whose ability to change forms threatens his life. 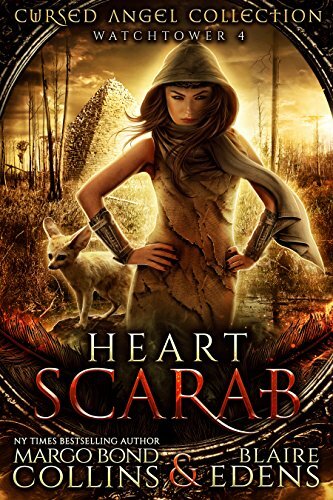 Together, they set out to brave the ten plagues of Egypt—traps Sekhmet has positioned around the pyramid holding the spell-stone that can save them all. But even if they survive the plagues, they’ll still have to face their own curses—not to mention Sekhmet herself. Angels and Witches must join forces to overcome the Demons that have cursed the earth. Many years ago, a demon inhabited a witch’s body to cast a spell to open all thirteen dimensions so that the demon spirits trapped there could be unleashed onto earth. But when the demons were released, the dimensions collided, creating rifts in the earth that re-divided the world into 13 continents, each with their own curse. In each city, high and protected in the city’s Watchtower, the Demon Lord of that dimension resides. And so long as that Demon remains on earth, his curse will reign over the Circle where he resides. In an attempt to reverse the damage, 13 of the strongest angels were sent to earth to defeat the Demon Lords. However, their sacrifice came at a price: they would have to take on the curse of the circle they were sent to, and would be damned to earth until the curse was lifted. Lifting the curse, however, means befriending a witch…which the angels believed to all be as evil as the demons themselves. These are the stories of the Cursed Angel watchtowers.